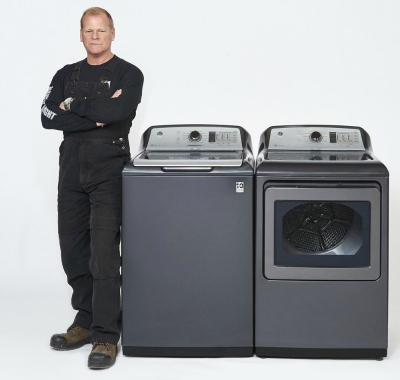 TORONTO – GE Appliances Canada has entered into a new multi-faceted partnership with television personality Mike Holmes, reputedly this country’s most trusted contractor. The pact, formally signed with The Holmes Group, will see Holmes as well as his son, Mike Jr., and daughter, Sherry, work together as spokespeople and ambassadors for the white goods brand throughout 2018. The all-encompassing partnership – which will include GE Appliances’ full suite of kitchen and laundry products – will come to life through in-store point-of-purchase displays, digital content and social media and PR activities featuring Holmes and his children. GE Appliances will also be seen on Holmes’ show, Holmes and Holmes, currently seen on HGTV Canada. They will also receive the coveted Holmes Approved stamp of approval. The partnership between GE Appliances and The Holmes Group will kick-off with a campaign focused on National Laundry Day on April 15. In the lead-up to the big day, the campaign will include original video content and a national media tour with Sherry Holmes, all of which will be amplified on social media. GE Appliances Canada is a subsidiary of Haier and manufactures, distributes and markets major appliances – including refrigerators, freezers, cooking products, dishwashers, washers, dryers, air conditioners, water filtration systems and water heaters – under six different brands, Hotpoint, GE, Haier, GE Café, GE Profile and Monogram.